Top row (left to right): 1. John King, 2. Cynthia ?, 3. Mark Weingardner, 4. Leslie Day, 5. unidentified, 6. Diane Schweiger, 7. 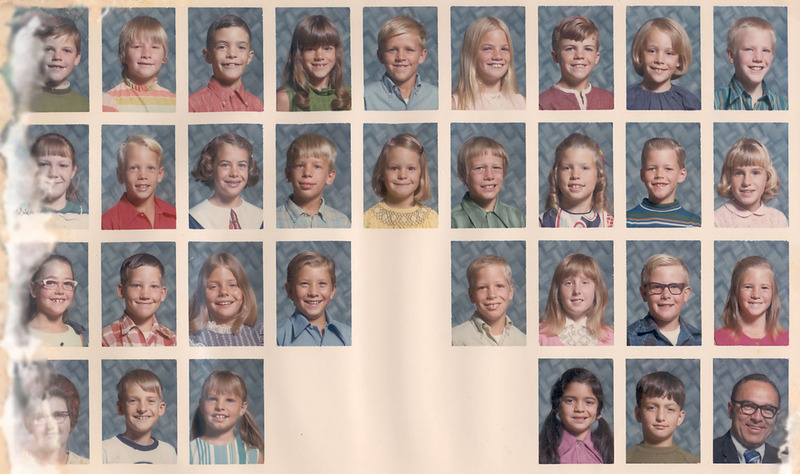 Warren West, 8. unidentified, 9. unidentified. Second row: 1. Kimberly Minor, 2. Richard Ludwig, 3. Suzanne Bohrer, 4. Carl Karfs, 5. Evelyn ?, 6. unidentified, 7. Claire Rufer, 8. Donald Hole, 9. Laura Cassell. Third row: 1. Gena Broadman, 2. unidentified, 3. unidentified, 4. John Mihoevich, 5. no picture, 6. Dennis Knor, 7. LeAnn Beggs, 8. Harold McCallister, 9. Colleen Pence. Fourth row: 1. Mrs. Roney, 2. Wylie Fabyan, 3. Brenda Tatjees, 4. no picture, 5. no picture, 6. no picture, 7. Debbie Alviso, 8. Clifford ?, 9. Mr Donald Larsen (Principal).